'cheese rich' 태그의 글 목록 :: Food Storyist. I wanted to have something fatty and starchy. That idea led me to chewy cheese on bread, Pizza. On the way home, My b-friend and I parked the cark at a parking lot middle of downtown. (it was near Kyungsung university in Busan). It was around 9:30, late for dinner for Korean. holding hunger, we wanted to try something new like hungry adventurers. Imsil cheese pizza, very wellknown brand but rarely found, caught our eyes, so we hurriedly enter into it. Oh god, it was closed. The staff said it finished at 10 to dismay. On opposite side of road, we saw the red sign glaring. Our eyes glared. We soon recognized it Pizzahut. 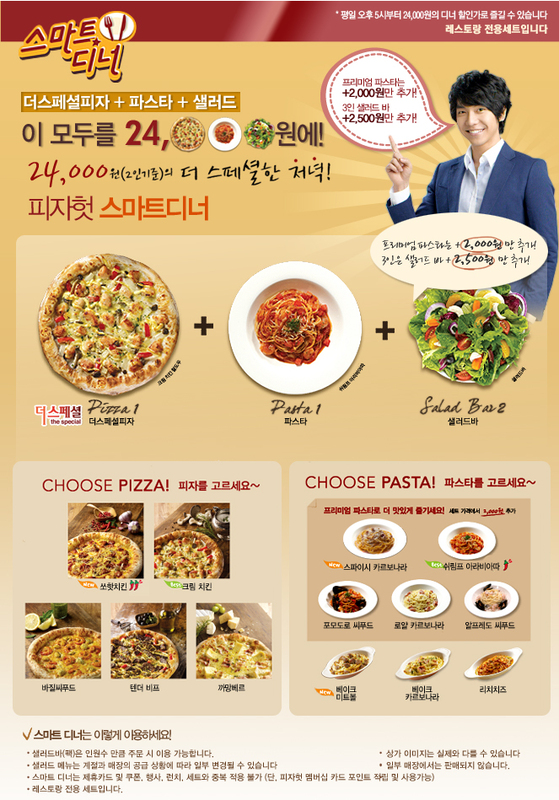 One of the most popular places, the oldest franchise pizza shops in Korea. I used to eat pizza at Pizzahut frequently 10 years ago. There were hardly optional places to have pizza in my village in the past. And I liked its new western food, pizza itself. But now, I disliked its outdated image of the pizza hut. Whether liking it or not, at that time, late at night, I was just craving for pizza itself. Entering the shop, we checked the closing time. The sign on the door says it closes at 11 to relief. A young staff greeted us cheerfully. We sat on a window-by table and flung open the menu book. Our eyes started prowling about. The staff, staring at us, all of a sudden, called us calmly. With a grin, she recommended us the smart dinner set proudly. Smart dinner set? I’ve heard of smart lunch, but never smart dinner. I look through the menu description on the book. It’s available from 5 pm on only weekdays. It consists of ‘the special pizza’, pasta and a refillable salad bowl for two. It only costs you 24,000 for all of them. You can choose one pizza among ‘so hot chicken’, ‘cream chicken’, ‘bazil seafood’, ‘tender beef’. and ‘camangber’, and one pasta among ‘baked meatball’, ‘baked carbonara’, ‘rich cheese’, and more pasta options available if you pay extra 2,000won. If you are three people, you pay 2,500 won more for salad. No Discount(by credit card, mobile card) applied. We ordered Cream chicken pizza, Rich cheese pasta, Salad and a glass of coke. After 20 minutes, all food was served and looked so yummy. The pizza was good, the pasta was good. In terms of salad, there were new menus. Yuzu jelly, Caramelized Sweet potato, Passion fruits, and Cozze. I was so glad to spot Caramelized sweet potato(Goguma matting), and I piled it up on the plate like a rocky mountain and brought to the table. I was really satisfied with pizzahut there. I liked all dish we ate. I was happy with its thin dough of the pizza and thick layers of cheese on the pasta and, especially newly added salad menu, Caramelized sweet potato(Goguma mattang). Haha. It’s quite weird to recommend a side dish of the restaurant. Why not? You must try it there.